How to get unlimited Verizon hotspot data for $50 a month. Shh, it's a secret! How would you like to score unlimited Verizon data from a Big Red hotspot for $50 a month? All you have to is join the Family Motor Coach Association, better known as the FMCA. This is a group of RV owners that gang up together to save money on RV insurance, campground costs, roadside assistance, tires and more. Among the "and more" part is a deal that the organization made with Verizon. Sign up for the FMCA for a one-time charge of $50. 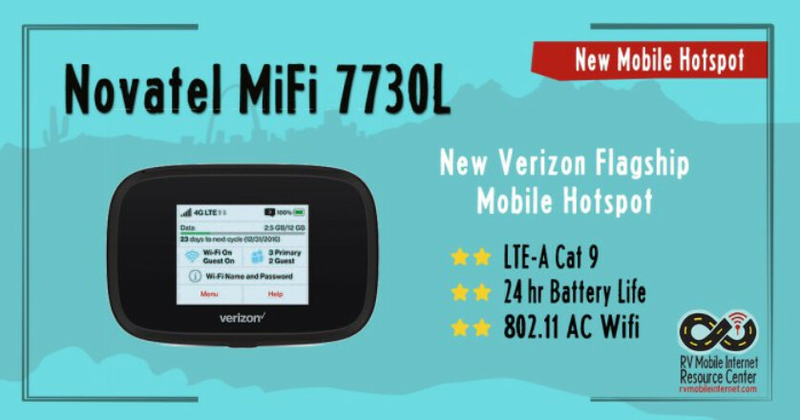 Verizon then gives you a Novatel MiFi 7730L wireless hotspot for free, and allows you to access unlimited data via the hotspot for $50 each month. And because it is the FMCA billing you instead of Verizon, your invoice might not come with any of those unsightly extras that you might have seen on other carrier produced statements. While you will receive unlimited data via the hotspot, once you reach 25GB of data usage for any given month, you will be "deprioritized." That means if there is a period when cell towers are congested with traffic, your data speeds are throttled. This might not occur often enough for you to worry about it. Remember, this particular deal is not being advertised by Verizon and is a little secret over at Big Red. First step is to sign up for FMCA membership, which you can do by clicking on the sourcelink. Then you will need to contact Verizon and tell them that you want to subscribe to its FMCA wireless hotspot plan for $50 a month. And don't forget that this is a big secret! If it's a secret, then why are you telling us? Already using over 100Gb a month on my Hotspot, even at throttled speeds I can play PC games with a ping around 70ms and stream all the Netflix I want on my PC. So you got this deal through the FMCA? Wish there was another way to get it. Also, when they throttle your speeds, what do you drop to? Thanks for any help. What does it matter how you get it? You don't want to be considered a camper? Nah, just the hotspot on my phone. They claim to limit it to 10Gb/month high speed but I don't seem to get slowed down. I'm out of town right now but I can test it when I'm home again. I have a phone line I leave going almost 24/7 as a hotspot for my computer, no home internet. Big Red, as s**tty as the gum. But the fee to sign up for FMCA is $60 for the first year and $50 for the annual renewal. Also, the $50 rate is only guaranteed the first 12 months. Informative and helpful if that fee works for your situation.